In order to ensure nuclear power plants in the U.S. are safe, we continually inspect them and rate their performance. If a plant’s performance declines, we increase our inspections and oversight to make sure the plant operator corrects the situation. Then, every spring, the NRC sends what we call an annual assessment letter to the owners of each nuclear reactor. The letters cover their performance for the previous calendar year. In the most recent letters, which went our earlier this month, 99 of 104 nuclear reactors were performing at a high level. There are five levels of plant performance based on a detailed assessment of performance indicators and inspection findings. 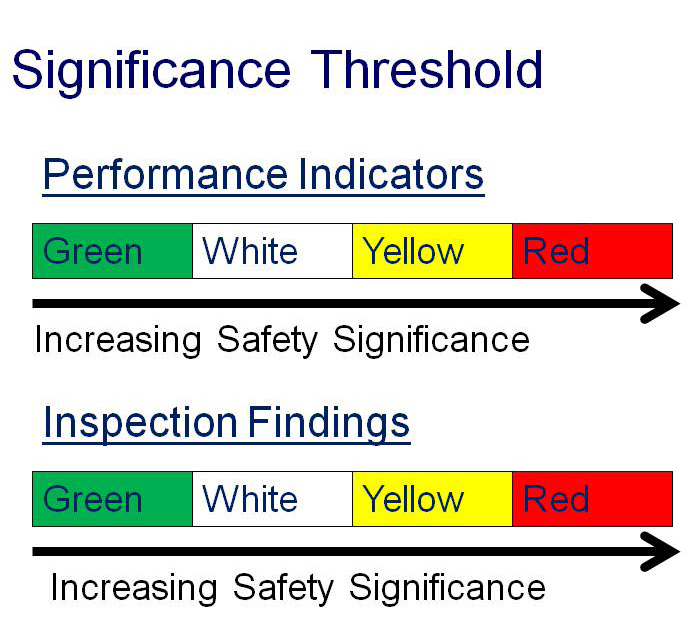 The levels range from “fully meeting all safety cornerstone objectives” to “unacceptable performance”. The level of a plant is determined by a detailed assessment of many areas of performance, such as safety system availability and reliability, control of radiation exposure and unplanned shutdowns. • 88 nuclear reactors fully met all safety cornerstone objectives and were inspected using our normal detailed level inspection program. • 11 nuclear reactors needed to resolve only one or two items of low safety significance. For this performance level, regulatory oversight includes additional inspection and attention to follow up on corrective actions. These plants were: Brunswick 1 and 2 (N.C.); Byron 2 (Ill.); Cooper (Neb. ); Crystal River 3 (Fla.); Limerick 2 (Pa.); Millstone 2 (Conn.); Pilgrim (Mass. ); Prairie Island 1 (Minn.); Sequoyah 1 (Tenn.); and Waterford (La.). Since the reporting period ended, both Byron 2 and Cooper have resolved their issues and have transitioned to the highest performing level. • Three nuclear reactors, Palisades (Mich.); Perry 1 (Ohio); and Susquehanna 1 (Pa.), performed at a degraded level of performance. These plants will get additional inspections, senior management attention and oversight focused on the cause of their degraded performance. • One reactor, Browns Ferry 1 in Alabama, requires increased oversight because of a high significance safety finding, which will include additional inspections to confirm the plant’s performance issues are being addressed. • The Fort Calhoun plant in Nebraska is in an extended shutdown with significant performance issues and is currently under our special oversight program distinct from the normal performance levels. Therefore, the plant did not receive an annual assessment letter. Later this spring and summer, we will host a public meeting or other event near each plant to discuss the details of the annual assessment results and inspection plan. We also routinely post changes to plant performance on the NRC website. The next letter on plant performance will be the mid-cycle performance assessment in September. The NRC program of overseeing this nation’s reactors never ends. But the letters gives the public — and the nuclear power plant owners – a regular report card and, when necessary, the path that will get them back to the honor roll. I guess so that nuclear power plants are sensitive things for public. Most of the people worry about this. From this article it’s nice to know the present situation of the nuclear power plants in the U.S. It’s mentioned here that U.S. citizens are safe from this nuclear power plants. I think this article will help us to live our normal life without worry about this. Thanks with regards.